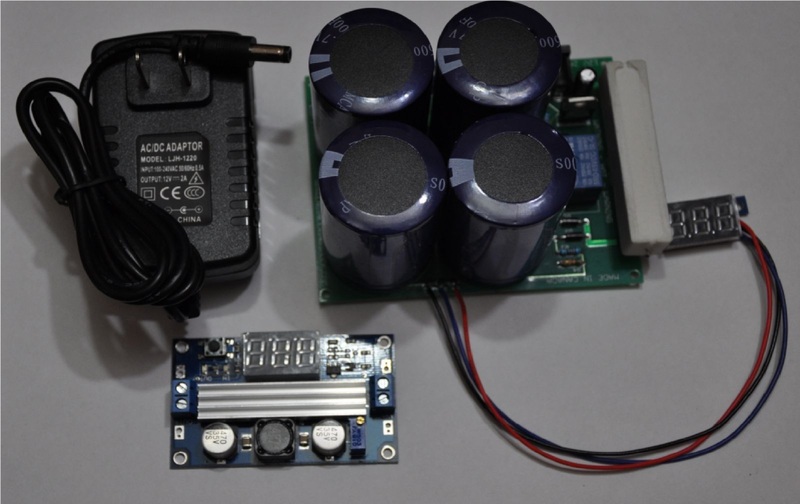 This listing is for a fully assembled 400 farad 5.4v portable super capacitor battery with a voltage display, a high power voltage booster module with display, and 12v 2A AC adapter. This unit is designed to charge at 1.5A. As soon as you plug in the AC adapter, press the on board charging button to commence charging. Once the bank has charged to roughly 5.2v, the on board LED will start to flash, and the capacitor will discontinue charge. The bank is rated for 5.4v, but since super capacitors have a tolerance of about 10%, I always ensure that the bank is charged to below the maximum charge voltage of 5.4v. When the capacitors are not being charged, they are completely isolated from the rest of the circuitry to ensure that there is no back-powering. When charging is complete, press the charge button one more time to reset the system, or simply unplug the AC adapter. Please consider the above video to be your user manual. We have also listed all of the relative information below. If you think that we have missed something, or perhaps you have additional questions, please do note hesitate to ask! Variation#1: Includes a soldered on voltage display, fully assembled super capacitor battery with on-board charger circuitry, and a 12v 2A AC-DC wall adapter for plug-and-play charging. Variation#2: Includes a soldered on voltage display, fully assembled super capacitor battery with on-board charger circuitry, a 12v 2A AC-DC wall adapter for plug-and-play charging, and a 2A MAX 3.4v-34v variable voltage booster with solderable input/output pins. 1) On board charge limiting. 2) The soldered on voltage display shows the user the input voltage to the charger when the capacitors are not charging, and the capacitor voltage when the bank is charging. 3) There are two sets of output ports so that the user can access the stored energy on the super capacitors. The first is a terminal block that has two connections labelled CAP+ (Positive DC capacitor voltage), and CAP-, which is simply DC ground. Ideally, this is where you would connect your voltage booster. The second set of output ports are simply large solder pads to the left of the output terminal block. They are labelled simply with plus (+) and minus (-) signs. These ports can be used to add capacitor banks in parallel with the charger. If you want to interface a separate bank in parallel, it MUST be rated for 5.4v. For instance, the capacitor bank on the board is rated for 400 farads, at 5.4v. If you had two 3000 farad 2.7v capacitors, you couple place them together in series to create a 1500 farad 5.4v bank. Place that bank in parallel with the (+), and (-) outputs to make a 1900f 5.4v bank (400f + 1500f). If you need more information, please do not hesitate to ask. 4) The super capacitor bank is rated for 100,000+ charges, as super capacitors will potentially last longer than we will if treated properly. This board was designed to do just that; treat the capacitors right! 5) Minimal leakage current. All capacitors have a leakage current. You will lose about 10% of your charge over a 24 hour period before the capacitor bank begins to stabilize. If you charge to 5.2v, and use the power right away,then this power will not be lost. 6) Four mounting holes on the main board, and two mounting holes on the voltage display board. 7) A Fast charge! When you first charge your board, it should be at around 100mv or less. From this voltage to the full 5.4v charge at a current limit of 1.5A, it only takes about a half an hour to charge. From 3v, it should only take about 10-15 minutes. 8) There is an on board LED indicator that will tell you when charging has completed. - You can use the stored power DURING charging! 1) DO NOT short the output pins, or place this unit on a conductive surface. Super capacitors have a very small ESR (internal resistance), and if a dead short is applied to the outputs, the traces may burn, and you may have a fire hazard on your hands. The capacitors will not be damaged with a short, but the traces one the PCB will likely be. The traces to the capacitors are very thick, but you should not load the output with more than 7A of current for more than a few seconds at a time. This is a precaution. 2) THE CHARGE RESISTOR WILL BECOME VERY HOT DURING CHARGE!!! On the bottom of the board, you will see a warning that the charge resistor will become extremely hot during charge. DO NOT touch it. Also, do not touch the 7805 voltage regulator, as it will become slightly hot as well during charge; although not nearly as hot as the resistor. During the first charge, you might notice a burning smell coming from the board. This is the resistor buring off residual chemicals, and should only really happen once. It is expected. Simply plug in the AC adapter, and press the CHG button to begin charging. When charging has completed, the LED will flash until you either unplug the AC adapter, or press the CHG button. Once you press the CHG button, the system will reset. If you want to charge again at this point, simply press the CHG button a second time in order to begin re-charge. This unit will be shipped with expedited tracking within Canada and the US. You will receive tracking after the unit is shipped. Please feel free to ask if you require any additional information after watching the above video, and after reading the listing information, and we will try to get back to you as soon as humanly possible!